The unintended but entirely predictable consequences from the UK's disastrous Counter-Terrorism and Security Act keep on a-coming. You will recall that this handy piece of legislation tasked teachers with weeding out possible future-terrorists amongst the young folks they are supposed to be teaching. This has devolved instead into teachers reporting children, usually children that would be peripherally identified as Muslim children, to the authorities for what aren't so much as transgressions as they are kids being kids. It has even turned some teachers into literal grammar police, because the universe is not without a sense of humor. And now we learn that these part-teacher-part-security-agents may be incorporating art criticism into their repertoire, having reported a young Muslim boy of four years old to the authorities because of his inability to properly illustrate a cucumber. Concerns were raised after the youngster drew a picture of a man cutting the vegetable. [The child's mother] said she feared her children would be taken away from her and added: 'But I haven't done anything wrong... It was a horrible day." Teachers and public service workers have a legal obligation to report any concerns of extremist behaviour to the authorities since July. And here is the picture the child drew of himself cutting a cucumber. 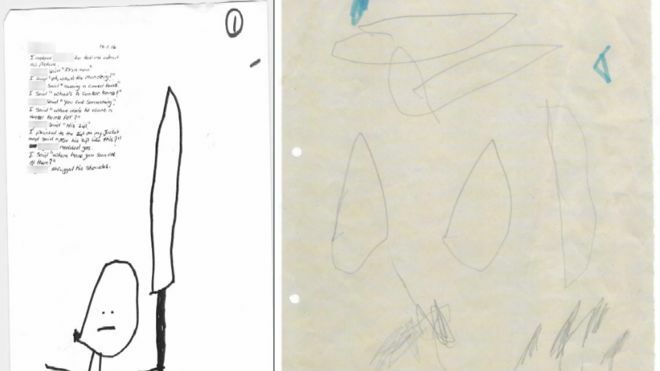 Now, if we hold our nose and choose to forget for a moment that this is a four year old we're talking about, and not the re-animated corpse of Vincent Van Gogh, we might all agree that the picture on the left looks like a person holding a giant freaking sword, instead of a kitchen knife. The picture on the right will look like pretty much anything you want it to look like because, again, this is a four year old toddler we're talking about. So, it appears the teachers asked the child what he was attempting to draw in the picture, and the response would have been benign, except it hit one of the terrorism buzz-words, kinda sorta. Staff in Luton told the child's mother they believed he was saying "cooker bomb" instead of "cucumber". "[The member of staff] kept saying it was this one picture of the man cutting the cucumber....which she said to me is a 'cooker bomb', and I was baffled," she told the BBC Asian Network. So the child, in addition to being unable to draw a cucumber sufficiently to get teachers to understand the portrayal he was attempting, also wasn't able to properly pronounce the word cucumber, and it apparently came out of his mouth close enough to "cooker bomb" for the nursery staff to freak out and into the de-radicalization program the child goes. I can't stress enough that this child is four years old. Nor that the staff's interpretations here don't make any sense. So they believed the child was saying he was sawing into a cooker bomb with a death-sword? And that's a more plausible scenario than the staff concluding that this toddler was doing something completely innocent and wasn't articulating properly? One wonders, as always, just how much leeway would have been afforded the boy if he had pale skin and blue eyes. More resource-friendly to brutalize in-country kids into becoming terrorists than having to ship troops and government agents overseas to do the job. Much reduced carbon footprint for us and the future terrorists.